I am grateful for the endorsement I received from the Michigan Vaccine Freedom PAC. As a principled libertarian I am called on to support freedom, including vaccine freedom. This is why they endorsed a large number of other Libertarians. The Michigan Vaccine Freedom PAC (MVF-PAC) endorsed fifteen Libertarian Party candidates. This is likely the largest number of endorsements of Libertarian Candidates in Michigan by a single PAC. Since these were pre-primary endorsements, they are a direct consequence of The Libertarian Party of Michigan’s primary party ballot status. 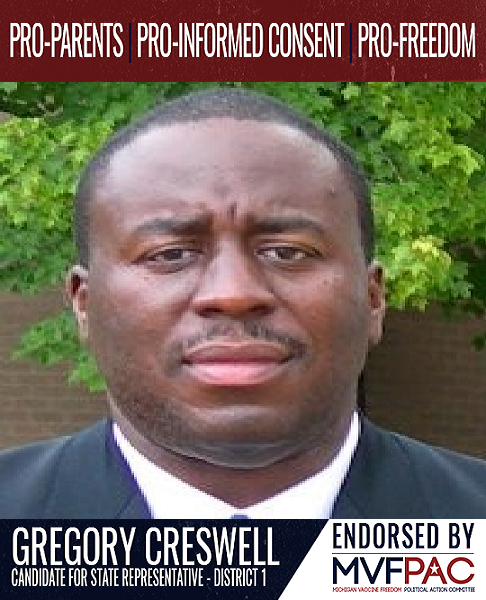 Gregory Creswell for District 1 State Representative. Ryan Manier for District 28 State Representative. 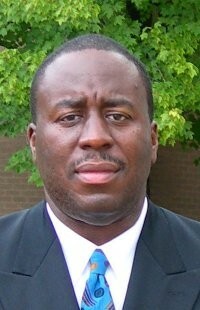 Brian Wright for District 38 State Representative. Norman Peterson for District 64 State Representative. Jason Rees for District 65 State Representative. Patty Malowney for District 77 State Representative. Tyler Palmer for District 93 State Representative. Joseph LeBlanc for District 7 State Senator. Chad McNamara for District 17 State Senator. Erwin Haas for District 26 State Senator. Nathan Hewer for District 28 State Senator. Max Riekse for District 34 State Senator. Jamie Lewis for District 72 State Senator. I support an individual’s right to make vaccine decisions for themselves and for their children. I support the legislative process as it relates to vaccine choice. I do not support the practice of un-elected state or local agencies placing undue burdens on individuals seeking vaccine waivers. I do not support mandatory vaccination by employers or educational institutions that receive tax-payer funding. In some cases, more than one candidate was endorsed for the same position in the same primary, so this appears to be the only criteria. The MVF PAC and its contributors are excited and pleased to give you our full endorsement. We have also encouraged our contributors and activists to contact your campaign directly and volunteer in whatever other ways to help you win this election. Attached to this email is also a frame you can combine with your picture to share your endorsement with the public on social media. We will communicate our support and endorsement of your candidacy via social media, webinars, town hall meetings, robo calls, and direct mail. Both the Michigan Vaccine Freedom PAC and our sister organization, Michigan for Vaccine Choice (MVC), are so grateful for your decision to support and defend vaccine choice as part of your many other missions as an elected official. We hope, with your support, to preserve parental and individual rights to make vaccine decisions in Michigan, without government interference or regulatory burdens. We will also be working toward ensuring that our state agencies, such as Michigan Department of Health and Human Services and Michigan Department of Education, follow state and federal privacy laws as it relates to student medical information. Unlawful practices put our federal education funding at risk! We wish you nothing but a successful election campaign and will do what we can to make it happen for you. Please email me at info@michiganvaccinefreedompac.com with any questions you may have.